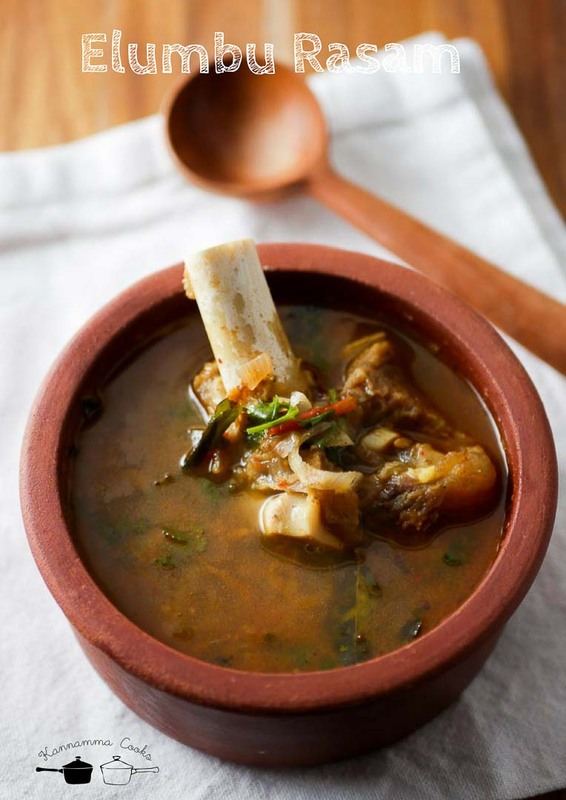 Mutton rasam is a very simple and very comforting recipe served when someone in the family is down with cold or a nasal congestion. Its usually served as a soup or mixed with rice and served as rasam rice. It tastes heavenly when mixed with rice. The natural antihistamine in the kitchen! Here is the video of how to do Mutton Rasam. For this recipe, we need to make a spice powder. This spice powder is the main ingredient that flavors the mutton rasam. We will be dry roasting all the ingredients and the grind it to a powder. Take a pan and add in all the ingredients listed under spice powder. Dry roast all the ingredients on a low flame for 3-4 minutes. The spices will turn very aromatic and will change color to slightly golden / brown. Set aside to cool. Once the masalas are cool, grind to a fine powder in a heavy duty mixie. Set aside. 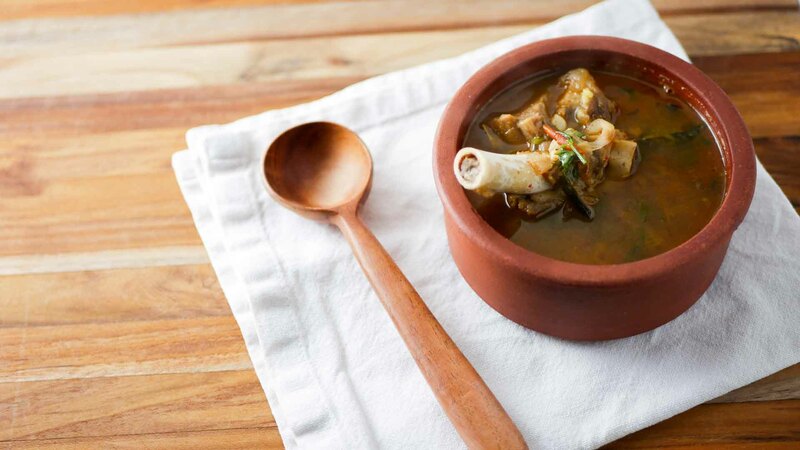 Boil the mutton bones with turmeric, salt and water for 20 minutes in a pressure cooker. Switch off the flame and let the pressure from the cooker release naturally. Set aside. Heat sesame oil in a pan and add in the chopped garlic, shallots (small onions) and curry leaves. Saute till the onions are soft. Add in the tomatoes and the salt. Remember that we already cooked the mutton bones with salt. So be cautious not to over salt the rasam. Cook the tomatoes till its soft and cooked down. Add in the spice powder and saute for a few seconds. Do not saute for a long time after adding the spice powder. The spice powder may burn. Add in the cooked mutton along with the water. Simmer for five minutes. Add in the coriander leaves and remove from heat. Serve the rasam as a first course as soup or as a main course mixed with rice. It tastes heavenly when mixed with rice. Recipe for mutton elumbu rasam. Mutton broth simmered to a thick soup with home made masala powder. Very comforting recipe for cold and nasal congestion. Dry roast all the ingredients on a low flame for 3-4 minutes. Set aside to cool. Once the masalas are cool, grind to a fine powder in a heavy duty mixie. Set aside. 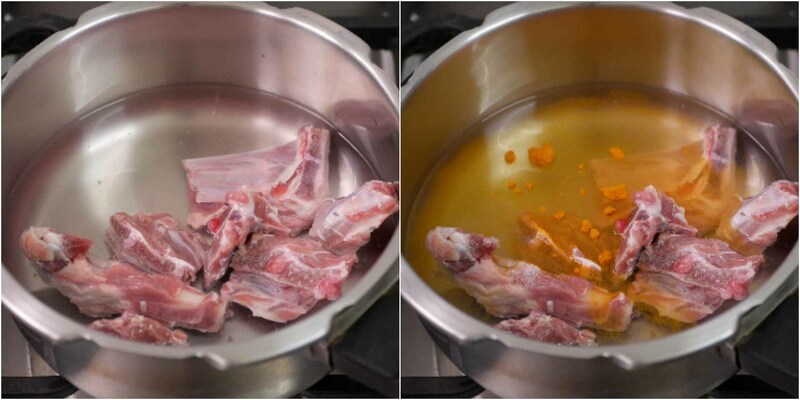 Boil the mutton bones with turmeric, salt and water for 20 minutes in a pressure cooker. Switch off the flame and let the pressure from the cooker release naturally. Set aside. Add in the tomatoes and the salt. Cook the tomatoes till its soft and cooked down. Add in the spiced powder and saute for a few seconds. Serve the rasam as a first course as soup or as a main course mixed with rice. It came out well. Thank you. Hats off to you. Excellent recipes for everyone. Whenever I want to make a different dish I look forward for your site. I got many appreciation for my dish. Thanks dear. Keep on sending new dishes. Hats off to you. Excellent collection of recipes. Whenever I want to make new dishes I directly visit your page. Your way of method is awesome. It brings me lot of appreciation from food lovers. Once again thank you from bottom of my heart. Keep on giving new dishes. Hi, Suguna the way you made fresh masala and cooking procedure was really Awesome. Thank you for this recipe. It turned out yummy and my kids love it with rice and idli and even as soup. Your recipes look divine. And I really appreciate your directions. They are so helpful. Will be excited to try them out. Thank you so much Saranya. Glad you liked it! 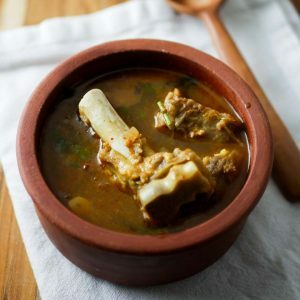 how many whistles when boiling the mutton bones in cooker? 20 minutes. Go by minutes.